Bow Wow Buddies Feature Story: Logan! 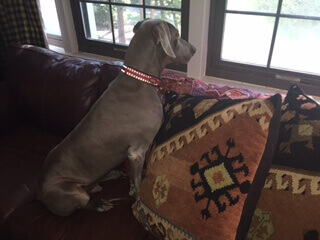 Today, the Bow Wow Buddies Foundation would like to introduce you to Logan, a 6-year-old Weimaraner from Atlanta, GA.
Logan was living happily with his foster mom, when he began to act very strange one night. His mom knew he must be ill, but was unable to pinpoint exactly what was happening to poor Logan. So, she did what any loving dog-mommy would do – she rushed Logan over to BluePearl Veterinary Partners to be seen by an expert. Turns out, Logan was diagnosed with a Leydig cell tumor (LCT) that needed to be removed as soon as possible, as it could be painful and could spread rather quickly. Unfortunately, the procedure was far too expensive for Logan’s foster mom and his friends at Atlanta Weimaraner Club Rescue to afford. Cue the Bow Wow Buddies Foundation! 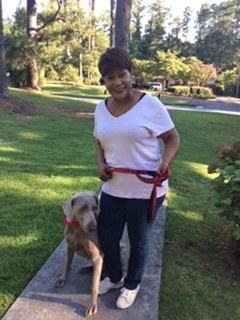 After some consideration, the folks at Atlanta Weimaraner Club Rescue knew what they had to do. They reached out to The Bow Wow Buddies Foundation for help – and of course, we were happy to lend a paw! Through a grant from The Bow Wow Buddies Foundation, Logan was able to get the medical attention and costly surgery that he needed in order to have the painful tumor removed. His surgery was a success, but the best part of all was that in the end, Logan’s foster mom realized she couldn’t imagine life without him – so she decided to adopt him for good! Here at Camp Bow Wow, caring for and loving dogs is what we do best, and The Bow Wow Buddies Foundation is a strong reflection of that philosophy. Each year, many pets are denied access to urgent medical care, simply because their parents, foster parents, or rescuers cannot afford the climbing costs of emergency veterinary treatment out of pocket. The Bow Wow Buddies Foundation is happy to assist dogs and their families in their time of need. With help from donations, we’re able to award grants up to $2,500 for necessary medical treatments for dogs in need across North America. Lend a paw and donate today to help a dog like Logan get a second chance!